Model T Ford Forum: Not in the catalogue? Ask! Not in the catalogue? Ask! Model T Ford Forum: Forum 2013: Not in the catalogue? Ask! When I see Don Lang or Bill Devine at an auction I know they're not there just for the entertainment. They're buying stuff to sell. Too many folks assume that if an item isn't listed in a dealer's catalogue he doesn't have it. In fact, most dealers have used or NOS items that aren't listed in their catalogues. 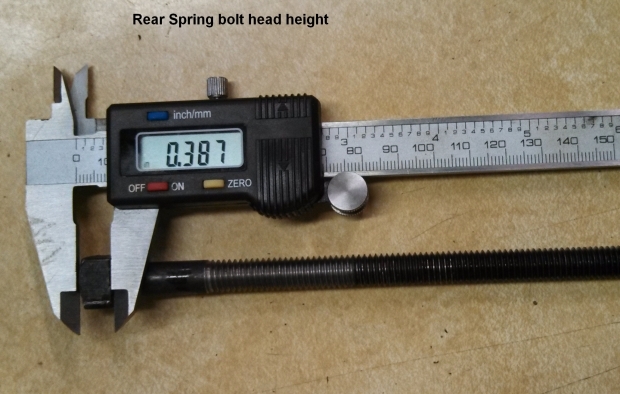 An example is this lovely rear axle bolt I got from Bob Bergstadt. Even if an item isn't listed, it doesn't hurt to ask. Looks like a rear spring bolt. Wish someone would make repros of both front and rear spring bolts. Yep, I said axle but I meant spring. As common as it is for those bolts to be broken when they're removed, I'm surprised nobody is making them. I agree with Royce. The current spring bolts are not what the Ford bolts were. I suppose the folks making the repro's we get from the vendors think it's not important for them to be correct, since they don't show. But the heads are so small, it's difficult to get them into the hole in the crossmember if you use a spring pad. Maybe after all this conversation someone will step up and make good ones. RV? Larry? I find it weird, I have used many of the repop spring bolts and never, not once, I've thought this bolt is unusable. Sure the head is shorter, but not that much shorter that it is worth griping about. I am with Steve it is a good Idea to ask the vendors for parts that aren't listed. Is is possible the spring pads you are all using are too thick? The rubber pads I use are .129"
I'm with Mike - I bought a repro spring bolt and the thinner head on mine sits perfectly flush with the upper surface of the cross member. I'm using a leather pad between the cross member and the springs. If I had one of those "correct" bolts it would stick up way through the hole and be above the surface of the cross member. I don't think a lot of hobbyists have a great appreciation of what it really takes to get something even as simple as this made. Manufacturing companies capable of making this sort of thing won't give you a competitive price unless you want 10,000 made. Some manufacturers won't even talk to you unless you want 10,000. Now, suppose you do have 10,000 made for total cost of $0.75 each. That means that you just laid out $7,500.00 to have rear spring center bolts made. Right away you will wholesale quantities of 100 to all the major dealers at $1.25 each. So that is $125.00 coming in from about 6 dealers. A total of $750.00, which means you have now recovered 1/10th of your investment. If the vendors sell this part at a 60% markup, the bolts will retail in their catalogs (which are distributed up to a year later) at $2 each. Now, the next problem is; Even though your "correct" bolt is now available for $2.00, an "off the shelf" bolt that is similar is still available right next to it in those catalogs for $1.25... The only people that will buy that slightly more expensive "correct" bolt are the few dozen people who read about it on the forum, and the people who already tried the cheaper one and had a problem. 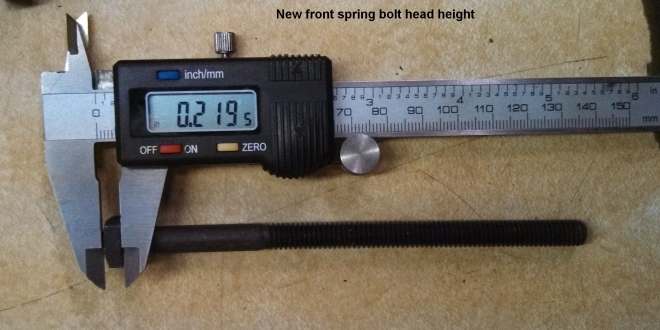 My guess is that 80% of customers will buy the incorrect $1.25 bolt and 20% will buy the correct $2.00 bolt. Now; How many of these bolts do you think you will sell each year and how long will it take to start making a profit on your investment? If it takes you 5 years to sell all 10,000, which I think would be very optimistic, then you have made a total gross profit of $4,875 wholesaling these. This amounts to $975 per year which sounds pretty good at first, but you have to also remember you wholesaled them in batches of 100 and you have to figure that your time is worth something packing up and shipping 20 orders per year, keeping track of what everyone owes you, receiving & depositing payments, etc. So you can figure you have 40 hours per year into the project because you also do some marketing & P.R., try to get smaller dealers to buy into batches of them, selling one or two at a time to hobbyists here and there etc. This amounts to about a $24.38 per hour income. And this is just a theory that figures you have the $7,500 just laying around waiting for a "project" like this. I am guessing that many people who manufacture T parts in any quantity probably have prior business experience, have written a business plan, and have their inventory of "manufactured parts" financed by a bank in some form, probably at somewhere around 4 to 6.5% currently... If this is the case, then at 5.0% interest, you paid the bank 992.40 interest over the course of 5 years. If interest expense averages out to an amount of $198.48 each year, then that brings the amount you "earned" on the project down to $19.41 per hour for the 40 hours per year you put into it. Bring that down to $14.17 per hour after 27% taxes. And there are more "expenses" that can potentially take a bite out of the whole thing.